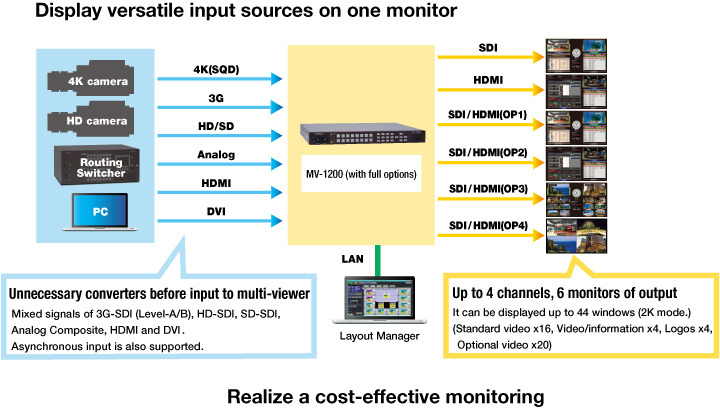 Compact (1U) multi viewer for monitoring, featuring up to 16 inputs and 6 outputs. 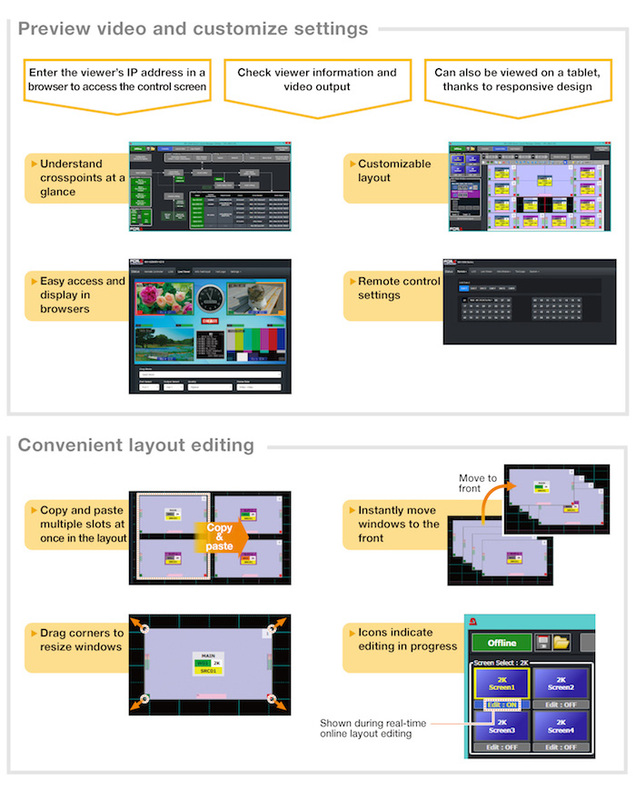 Build a versatile, flexible 4K (UHD) editing environment. *1 Use of MV-12EXP option allows both SDI/HDMI input and output. Use of MV-12EXP option allows both SDI/HDMI input and output. *2 Combine up to 2 optional input cards; MV-12SDI (3G/HD/SD-SDI, Composite x 4); MV-12PCI (DVI/HDMI x 4); or the MV-12IF interface card (GPIO, serial control; LTC input, genlock input), as needed. Import a bitmap from the logo registration screen, or generate and register a logo using a web browser. Customize layouts, using the software in Windows to adjust image size, position, title display, and other settings. Up to 16 preset patterns each for 4K/2K modes can be stored. Recall saved layouts directly from the front panel control. Video can be streamed from the multi viewer over Ethernet. Capture specied frames of streamed video. View error logs or user text in the Information Display. Input Lock enables genlock without using reference signals. Can display time based on a 30-hour clock. Register up to 24 schedule timers per day for 1 week.